That’s me…just “T.” My given name was Teresa (no “h”), misspelled on my birth certificate, by the way. It was written Treasa, but later corrected (I think), but not butchered as bad as my father’s last name on his birth certificate. His last name was Johnson. Pretty simple, right? Well, it was spelled Jozsonhoz (or something like that). I researched for a long time to make sure it wasn’t a name change, but his father and grandfather were both Johnson. It was the turn of the century and my guess is some German midwife who didn’t speak English probably couldn’t spell the name. 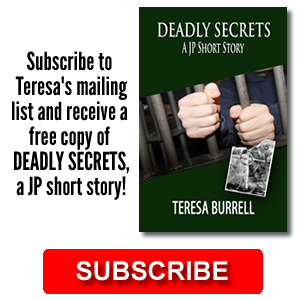 I was born Teresa, and other than a few childhood nicknames (Sweet Pea, Trazer, Honey Girl, Tree, and #9), stayed that way throughout grade school and high school. In college I somehow became Teri. That stuck for about ten years and then faded. People that knew me back then still call me Teri. The only recent friend I have who calls me Teri is Jeff Sherratt, my mentor and author of “The Brimstone Murders” & “Guilty or Else,” and he’s such a fabulous guy he can call me whatever he wants. When I taught school some student started calling me “Mrs. Charmin” from the toilet paper commercial…I was squeezably soft, I guess. That one stuck for a few years with the students. But mostly I was called “Coach” because I had a winning softball team for so many years. When I practiced law, my friend Bob started calling me Teebs. It caught on with a small group of very close friends…that’s where I got the idea for “Sobs” in my novel, The Advocate. When my nieces and nephews were little they called me Auntie T or TT. That eventually evolved into Tee or just T, which most of my family and adult friends now call me. But my all time favorite, which I mostly see written on emails, cards, and gifts, is FAT (Favorite Aunt Tee). The older I get the more I fit that one…the favorite part, of course. Aren’t names fun? I don’t really care what my family or friends call me, as long as they do. But I don’t like to see my name misspelled, so remember I’m Teresa, no “h” or Tee (Please no “h” in that either). What interesting nicknames have you had along your path in life? Sabre (pronounced Say-bra) is the name of my main character in my SOB Legal Suspense series. SOB, Sabre Orin Brown, is an attorney in the juvenile court system in San Diego. Her first appearance is in the novel “The Advocate” where she represents a nine-year-old whose father is fighting to keep the child protective services out of his life. Sabre’s job is to protect her minor client. What you might not know about Sabre is some of her background. She was raised Catholic, has only one sibling, Ron, who has been missing for five years, a deceased father, and some serious trust issues. She has strong beliefs in the legal system but seems to have that belief tested on a regular basis. Although she appears at ease in her expensive suits and shoes and speaking in the courtroom, she would much rather be wearing jeans and a t-shirt, and walking barefoot on the beach in the rain. Sabre’s second adventure is in the making in another SOB Legal Suspense novel, and great surprises await her. The name for the character Sabre came from a little girl who I met some thirteen years ago. She had so much love to give and at the time no one to give it to. She came into my heart where she will forever remain. How has a child changed your life? Writers, where do you get the names for your characters? Do you know how to relax and reduce stress? Frankly, I’m not very good at it, but I’m better than I used to be. When I was practicing law and had the occasional day off (about once every six months) I would spend more than half of it trying to figure out what I was going to do. Because, after all, I can’t just waste it, right? So I would waste it trying to figure out what to do so I wouldn’t waste it. So when I ask if you know how to relax, I must first ask myself that question. Here’s what I’ve learned. There’s all the standard stuff, like take a bubble bath, a walk on the beach, listen to soft music, do yoga, take deep breaths, get a massage, take a long shower, read a good book…these are all good things. But relaxing isn’t necessarily about being quiet and still. Try dancing. I don’t mean the slow, just swaying your body kind. Put on some Credence Clearwater Revival and rock! Let your body go, be goofy, and don’t think about anything else. You can’t relax if, while taking your bath or your walk on the beach, you’re still thinking about what you have to get done. There are also some basic techniques that help with relaxing and reducing stress, such as getting plenty of sleep, and good nutrition. And don’t miss the chance to laugh. Laughter is so important. Find something to laugh about, read some funny jokes, watch a sitcom, or dig out old photos from high school. I’ll bet they’ll make you laugh. If all that fails, you can do what I do when I really need a break. I drive to the movie theater, buy the largest popcorn and a box of chocolate covered raisons, shut off my cell phone, and watch a no-brainer movie. This is written for my good friend, Roberto, Quinones, who I affectionately call “Q.” He was a dear friend and colleague who recently passed away at the young age of fifty-two from prostate cancer. I can’t say the letter “q” without thinking about him, so I had to write this in his memory. Below is a picture of Q playing Santa Claus at Clinica del Ninos in Rosarito, Mexico where we go each year to provide a Christmas party for the children. Although a new Santa will fill his spot, no one will really take his place. Q was a very special person in my life and in every life he encountered. I first met him when he started work at juvenile court with the Alternate Public Defender’s office. He was basically there to take my job away. So you see, it would have been very easy to not like him. But the fact that we all did was an indication of what kind a man he was. He was honest, a straight-shooter, cared deeply about his clients, and believed strongly in the system. Not exactly how most people would describe an attorney. In addition, he was a wonderful father, had a great sense of humor, loved life, and always put everyone else’s needs in front of his own. I know people tend to say nice things about people after they have passed away, but Q was the kind of guy who people said nice things about when he was alive. So once again “Q” came through for me…providing me with a word for the hardest letter in the alphabet. Thank you. Ever since I blogged the “N” word, I’ve had many questions about my launch party for THE ADVOCATE, so I’m writing a bit more about that event. It was in a “p” word…phenomenal. Everyone was so gracious and made me feel so wonderful. I couldn’t have done it, however, without the help of my family and friends. We had a barbeque (thank you, David) and book signing. The weather was too hot, but other than that, everything was perfect. 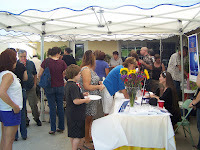 Over a hundred people attended the launch party, many of them not local. My dea r friend, Marilee, came the furthest, all the way from Kalispell, Montana. What a treat that was. My sister, Madeline, flew in from Idaho, and my niece, Kimmie, from Washington. I had friends and relatives from San Diego, Orange, Riverside, San Bernardino, and Kern Counties. Friends arrived from all different walks and times of my life. Some were from my teaching days, others from when I attended law school and then practiced law, from my private businesses, and even from high school (now that goes way back). The Advocate sales were over one hundred…not bad for my first. And if you missed the west coast launch and you live by that other ocean…come see me in Kennebunk, Maine at Kennebooks Bookstore on July 30th. Thank you all for attending, for buying my book, and for making me feel like a celebrity. That part was a hoot! The okapi has been one of my favorite zoo animals since I discovered it some years ago at the San Diego Zoo. I was fascinated by its reddish, dark velvety fur, which I later discovered was oily and hleped repel water in its natural habitat, the Ituri Rainforest. The stripes on the back end of the okapi make it look like it may be some sort of zebra, but in fact it is a member of the giraffe family. The body shape is similar to a giraffe, but with a much shorter neck. However, the okapi does have a long, flexible, blue tongue used to capture the leaves from trees like the giraffe. It is the only mammal that can lick its own ears. Now that’s impressive. The okapi is a beautiful animal. You really have to see one live to appreciate it. There are approximately 10 to 20 thousand left in the wild and only about 40 zoos or institutions house them in captivity. They’re not listed as endangered, but are threatened by pouching and habitat destruction. How many of you have seen an okapi? What’s your favorite zoo animal? I have spouted off before about what a remarkable family I have, but I’m going to do it again because I just experienced another example of how this family pulls together and just does what needs to be done like a well-oiled machine. 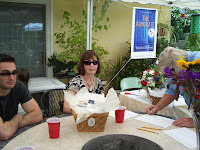 The launch party for my debut novel, The Advocate, took place last Saturday in Riverside, California. My sisters and their offspring, my amazing nieces and nephews (this includes great, and great, great nieces and nephews), just pitched in and gave me one of the most memorable days of my life. Their help and their support were incredible. And once the party was rolling they all bought books, from the oldest to the youngest. I can’t tell you the number of times I had to write “To my favorite niece” or “my favorite nephew.” Yup, they all wanted the same inscription. Later when my sister gave a last call for the books, her granddaughter, Allie (Alexandria) said, “I want one.” She’s four years old, but hey, her three-year-old cousin had one. Within minutes, Allie was walking through the remaining crowd and asking for forty cents. We have no idea where she came up with the forty-cent value of the book, but apparently she thought that was what it co st. One of the older nephews conceded to give her a dollar. Then she brought it to me and asked to buy a book. What’s an auntie going to do? She wanted her book signed “To Alexandria” (too important, I guess, for Allie). Then her ten-year-old cousin got a dollar from his older brother and he wanted one. Another book went for a dollar…so though the cost of the book had diminished immensely by the end of the night, the experience had been greatly enriched. Thank you all for making my launch party an experience I’ll never forget. When I started to write this blog I thought about how the “M” states had played an integral part in my life. In addition to Michigan I have a connection to most of the “M” states. Growing up in Minnesota I remember jumping rope to the Mississippi diddy: M-I-crooked letter, crooked letter-I-crooked letter, crooked letter-I-hump back, hump back-I. A good part of my family lives in Montana, so many that we chose to have our “Family Onion” there last year. My very dear friends live in Maine and I have the good fortune to visit there quite often (going again the end of next month). We had our last sister trip with all five sisters in Missouri (memories that will forever be dear to me). My publisher, Echelon Press, is located in Maryland. So that only leaves Massachusetts. Although I’ve been there several times, have some nice memories of Boston, but it’s the remaining state to develop a real connection. Any suggestions? Any of you connected to the “M” states? Limbo—I’m talking about the dance, not the place somewhere between heaven and hell. Do you remember the limbo? Are you too young? I remember being the limbo champ once in school. In all fairness, I think I had an advantage. Since I was only about four and a half feet tall, I was much closer to the ground than my fully grown friends. For those of you who are not familiar with the dance, the dancer leans backward and moves to a Caribbean rhythm as he dances his way under a horizontal stick without touching it. If he touches it or falls backwards, he’s out. During a competition the dancers follow in a single line with the stick being gradually lowered each time through until only one dancer remains. Research indicates that in certain African beliefs the dance reflects the whole cycle of life. The dancers are moving under a pole and emerging on the other side representing the triumph of life over death. Do you have a limbo story? Please share. She opened the office door. A familiar odor caught her attention–faint, but recognizable. Her brother’s favorite cologne, Kantor. It had been years since she had experienced the smell of his cologne, unsure if they even still made it. She would check with the other attorneys on Monday to see who in the building wore the cologne. She started to dismiss it when she noticed that her brother’s photo, on the credenza behind her desk, was facing the wall. She knew she hadn’t moved the photo. As she approached the spot where the stranger had been sitting, she smelled the familiar odor of Kantor cologne. Once again her heart skipped a beat. It was the only cologne Ron ever wore. The smell grew stronger the closer she came to where the man had been seated. She peered around, but he seemed to be gone. She watched as she walked to her car, but no further evidence of him, nor the smell, presented itself. More paranoia? I guess you’ll have to read the book to see where the smell of Kantor is coming from. If you haven’t done it already, you can click here to enter the drawing to win a free, autographed copy of The Advocate.